New wallpapers transform a room, giving it a brand new look. However, the hard part is removing existing wallpapers. Most wallpapers are not dry-strippable and do not peel off easily. When pulled, only the decorative surface layer comes out. The common practice of soaking the wall to remove wallpaper may become counterproductive and severely damage drywall or gypsum-based walls. This does not work when there are multiple layers to peel off, as the wallpaper is painted over in the first place. The solution is to use a wallpaper removal steamer along with a scraper. A wallpaper removal steamer consists of a hot plate and makes use of steam to soften the glue between the wallpaper and the wall, meaning that it does the task of wetting the wallpaper to make removal easy without wetting the walls. Fill the wallpaper steamer pan with water and heat it up. Hold the heated hot plate against the wall, ideally starting from top of the wall. Move the hot plate to another area when the wallpaper softens. Scrape the softened wallpaper with a scraper. Cover the wallpaper with small perforations beforehand using a wallpaper perforator to make it easy to peel it off. Use a sponge mop and solvent to wash off residual adhesive that remains on the walls. Make sure to wear rubber gloves and cover your hands completely, so that the steam does not cause injury. Wallpaper removal steamers work well on almost all walls, including gypsum walls, and almost all types of wallpapers, including wallpapers which were not properly sealed in the first place. 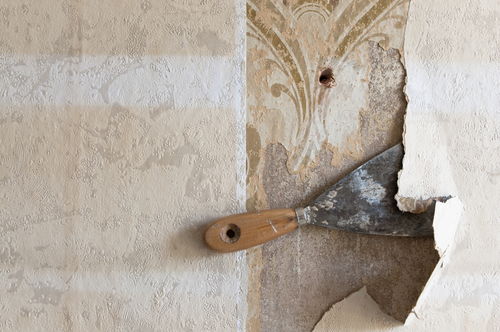 Before you begin removing the wallpaper on your walls, determine what sort of walls you have. If your walls are more than 50 years old, they are likely to be plaster walls and usually have two or three layers of plaster under them. When you knock on them, the sound you hear would be quite dull as plaster walls are pretty solid. If your home has been built in the last 50 years, you probably have drywall. Drywall is made out of a chalk-like substance and are built over wooden-framed walls, so they will sound hollow when knocked on. These walls are quite delicate and can be damaged as they are covered with cardboard, which means you need to be really careful when scraping off the wallpaper. Also identify if you have peelable or washable wallpaper. Each of these comes with instructions on the right peeling technique, which you must make sure to follow. With peelable wallpapers, the top vinyl coat can be peeled off easily. You then need to remove the backing with water. Stripping off washable wall paper is a little more difficult, as you must first break through the plastic sheet which the paper is covered with. Once you do your homework and understand what kind of walls and wallpapers you are dealing with, and the correct technique of removing them, the rest of the job can be done quite efficiently by renting the right tools. Boom lifts, also known as cherry pickers, help you reach heights easily. It’s articulating boom arms and extendable baskets allow a person to access normally out of reach work areas and also work in safety and comfort with their entire range of tools on hand. Most boom lifts are battery powered by hydraulic mechanism. The operator has the controls to move and adjust the height of the telescoping arm, as required. The operator in the bucket can control to adjust the position of the bucket. Automatic safety controls prevent tipping over. Boom lifts makes for a more versatile alternative to scissor lifts for many jobs. Unlike the latter, it is possible to maneuver it both horizontally and vertically, in a wide range. Using the boom lift, workers operating from a restricted base can reach out to elevated positions a distance away from the base as well. Boom lifts also have strong stabilizer legs, making them more stable. When you expect to have to scale heights or drop down several feet, make sure you have a boom lift ready for use, so you can accomplish your task easily and efficiently. 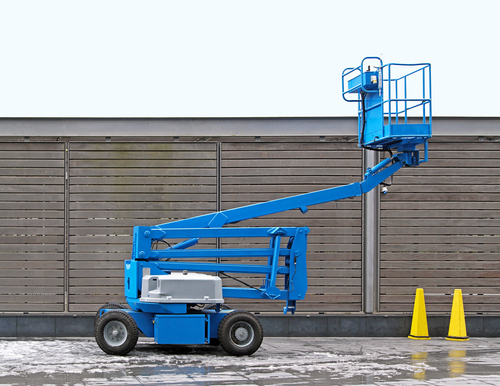 Renting a boom lift offers significant cost-savings. You pay only for what you use. You do not have to use a significant amount of your capital on machinery. You are spared the hassle of storing and maintaining and also get to select the latest and the most relevant machine, rather than having to make do with a single machine that may not suit your purpose. 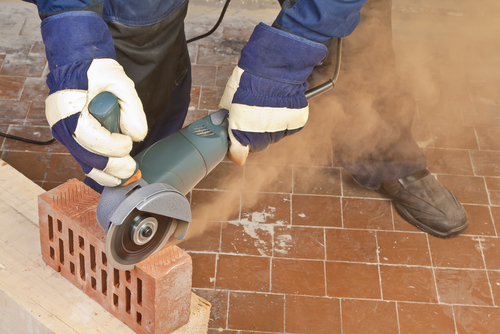 A concrete grinder is a handy tool for anyone seeking to upgrade the appearance of his or her home or office. It serves multiple purposes, providing finish for graffiti-covered surfaces, smoothing rough edges, and also roughing up floors before applying the finish. Concrete grinders come in many different kinds, ranging from small, hand-held angle grinders to heavy-duty industrial equipment that polishes concrete, granite or marble. The grinders also differentiate by being suitable for wet concrete, dry concrete or both. Small angle grinders work well as a DIY tool. For a smooth and uniform finish, ensure that the motor reaches its operational speed before grinding the surface. A good practice is to press down the handle before starting the machine, to release pressure from the grinding disc. The resulting weight shift allows the motor to reach its operating speed smoothly. Once the operational speed is attained, settle the grinder on the slab and begin grinding the surface. Concrete grinder wheels have two settings: transportation and grinding. Always make sure that the concrete grinder wheel setting is correct. Grinding when the wheel setting is for transportation or vice-versa may damage the accessories. When grinding, move the machine from side to side to eliminate swirl marks on the surface. The machine uses an abrasive, usually diamond grinding cup wheels, to grind or polish the surface. The shine depends on the grit of the abrasive surface. Grit starts as low as six, and 1800 provides the highest shine for a floor surface. Concrete grinder rental offers significant cost-savings. You pay only for what you use. You do not have to use a significant amount of your capital on machinery, and you also do not suffer from the machinery depreciating in value over time. You are spared the hassle of storing and maintaining the machinery, and also get to select the latest and the most relevant machine, rather than having to make do with a single machine that may not suit your purpose. Though you might think that all there is to mowing the lawn is switching the lawn mower on and pushing it across your yard. 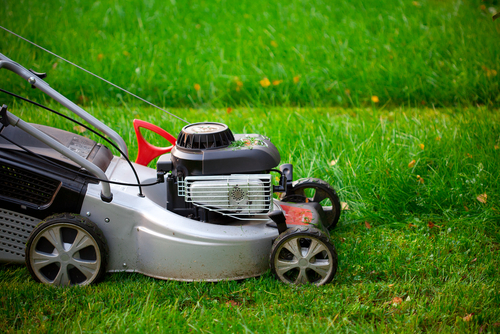 There are several things to keep in mind about the kind of mower you use on the lawn. What type of grass is your lawn and how low should it be cut, as well as, should you mulch or bag the grass clippings? Below we try to help you make the right decision. With the general thumb rule being never cut off more than one-third of the grass blade in the morning, the actual cutting height depends on the type of grass you have planted on your lawn, the season of the year and how well the lawn has been maintained thus far. This could range between 2-3 inches for Kentucky bluegrass and 0.5-1.5 inches for Bermuda grass. Speed is of the essence. Decide what speed controls you prefer, whether the exercise-free, self-propelled mowers or the push models. Try out a few mowers to see what works for you. Mulch, bag or shred. While lawn clippings degrade when left on the lawn and can be recycled in place, you also have an option of choosing mowers which mulch, bag, discharge or shred leaves. Most mowers come with two or three options, making cleaning up after mowing so much easier. Choose your mowing accessories cleverly, deciding on whether your mower is gas or electric operated, and choosing whether you will use a walk-behind lawn mower or riding lawn mower. All these decisions should be based on the type of lawn you have and the mower that will suit you best. Once you have yourself a suitable mower, frequent, correct mowing and sensible lawn care is sure to give you that green ball park-like lawn you’ve been aiming for. Happy mowing! Want to clear grass? Whether you are simply trying to clear grass from your driveway, beginning a DIY project to improve your lawn or engaging in professional landscaping, a sod cutter will make your life easier. A sod cutter does a complete job of cutting grass from the roots and exposing the bare ground underneath. The cutting blades with adjustable angles allow a fine and deep cut, even when the soil conditions and depth vary. Sod cutters come in different types. A kick sod cutter is more ideal to cut long and narrow strips of sod. This cutter comes with two long handles anchored with a cross bar. Kicking the cross bar moves the cutter along. A motorized sod cutter is the easiest to operate and is the best option to remove large quantities of sod. The operator raises the blade and sets the cutter in place before lowering the blade, starting the engine, shifting into gear and beginning the cutting process. The blade may be adjusted depending on the depth of the cut required. It makes sense to rent a sod cutter rather than buy one, as you do not need this tool on a daily basis, and it is imperative to choose the right type of sod cutter to ensure a job well done, without breaking your back. Motorized sod cutters require extensive maintenance, including monitoring the oil levels, regular cleaning and adjustments, as well as installation of replacement blades. 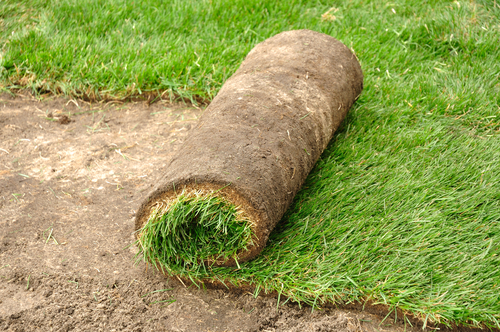 Renting a sod cutter often makes more financial sense and offers you flexibility as well. Whether you choose to rent or buy, a sod cutter can make any landscaping job a breeze. Check out your options and decide which type of cutter is the right one for you and your job! Want to lift or transport heavy goods? The obvious solution that comes to the mind is using a forklift. The fork-like prongs of a forklift slide underneath any load and scoop it up easily, ready to transport loads to a new location, regardless of the weight or bulk of the cargo. The weight at the rear of the forklift truck offsets the weight of the load lifted at the front. The utility of forklifts however, extends far beyond lifting weights. For instance, forklift trucks make a much cheaper alternative to hiring snow ploughs. Forklifts can clear parking lots, front yards and walkways of snow as well. Forklifts have now become an indispensable requirement for construction sites, warehouses, dockyards, recycling centers and many other commercial and domestic operations. But not everyone requires forklifts on a regular basis, and even if they do, individuals, and for that matter most small and medium businesses cannot afford the huge investment it takes to purchase a forklift. Moreover, buying comes with the difficulty of regular maintenance, without which, the forklift becomes risky to operate. Renting a forklift is often a more plausible solution for many individuals or small businesses. With forklift rentals, you can opt for the most appropriate type of forklift for each task – larger ones for heavier jobs and smaller ones for lighter jobs. Forklifts come in many types and sizes, ranging from small, pedestrian-operated machines to heavy-duty, driver-operated trucks. They are also distinguished as either compact or narrow trucks, which can navigate narrow aisles to shelf stackers that can store goods on racking systems at large heights. Determining which type of forklift you need is the first step in getting the job done. Once you’ve determined which type you need, deciding to purchase or rent a forklift will make your moving and lifting jobs much simpler. 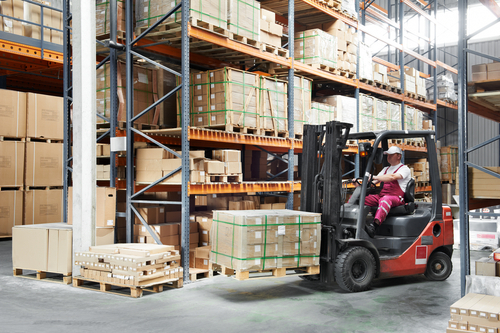 Forklifts also require less manpower, saving you a substantial amount of money, as well as cutting down on the risks of injuring employees during heavy-lifting tasks.